It's only a week until the best holiday of the year for kidlit bloggers: International Book Giving Day!!! Have you already figured out how you will get books into other people's hands? I would like to give a book...to you! Fill in your deets on this handy dandy form to enter my giveaway for a copy of Should I Share My Ice Cream? by Mo Willems. 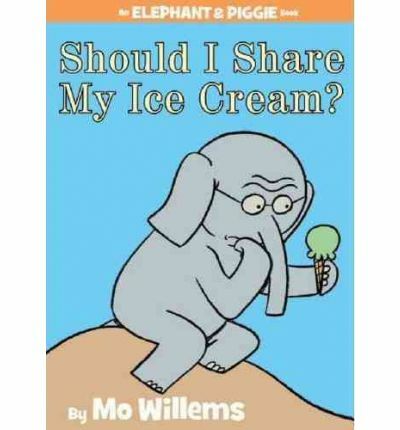 My son chose this book for the giveaway because, he says, it's about sharing which is the point of book giving day, and it's about ice cream, which is kind of like chocolate, which is what Valentine's Day is all about. Also because he read it all by himself and he wants the internet to know. Okay then. Let's roll with that. Enter below, and don't forget to tell me in the comments how you will celebrate Valentine's International Book Giving Day. No need to post your email address/personal contact info in your comment, Rafflecopter takes care of that privately. Yay! 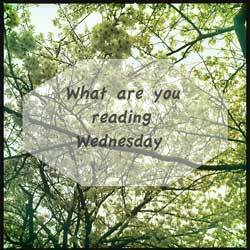 What is on your reader this cold February day? 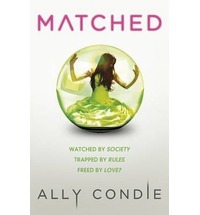 I've started a new YA post-apocalyptic series, the Matched series by Ally Condie. It's about a society where most choices, like work, meals, and spouse are made by the government. It's not bad but there's a threat of a love triangle which annoys me to no end. 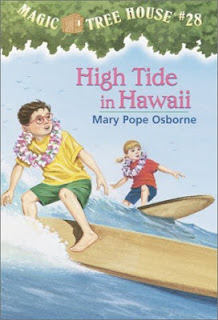 I'm reading Magic Tree House #28: High Tide in Hawaii to my kids. 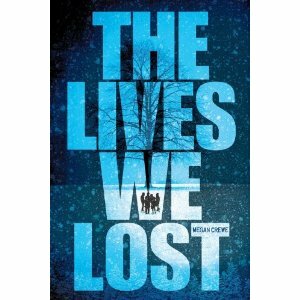 It's a lot more complicated than the earlier books in the series we have read so it's a challenge but so far we are enjoying it. What book is open in your lap today? Henri Rousseau is such an inspiration to desk-jockeys who have a passion for something creative. He proves that it is never too late to do what you love, and that listening to your inner voice is more important than critical voices that surround you. I'm not sure that kids will relate as much to the first message as their parents will. But every kid will experience peer pressure at some point so knowing that others have not only had to deal with that but also have been able to be a success is good to know. The star of this book is definitely the art. It must be intimidating to illustrate a biography of an artist, as the balance between the original art and the story that needs to be told is delicate. It must be more intimidating when the subject's art is so famous. But Hall strikes the perfect balance. 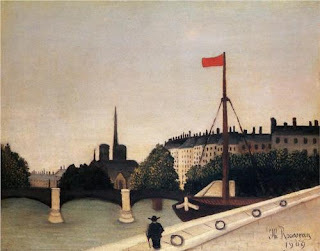 Hall's homage to Henri is reflected best in the Paris spread, where you can see shadows of some of Rousseau's most famous landscapes, including my favourite, Notre Dame View of the Ile Saint Louis from the Quai Henri IV, as well as Landscape with Bridge and others. 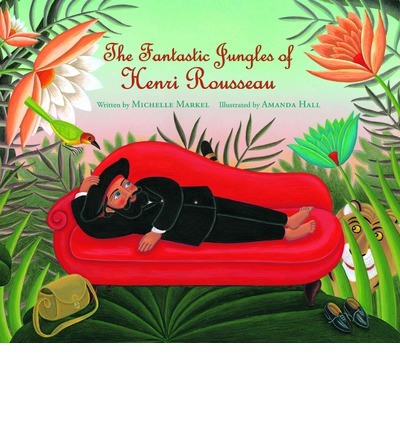 She includes Rousseau the same way he included himself- but there are many more as he journeys through the city and through the art world. This was an amazing introduction to the naïve art style, which is really appealing to kids with its vibrant colours and visible passion. This post is for Nonfiction Monday, hosted this week by Apples with Many Seeds.